For the last several years, the youth group at our church has participated in a Progressive Dinner. If you have never heard of this concept, it is where different families host portions of the meal: Appetizers, Main Course, and Dessert. 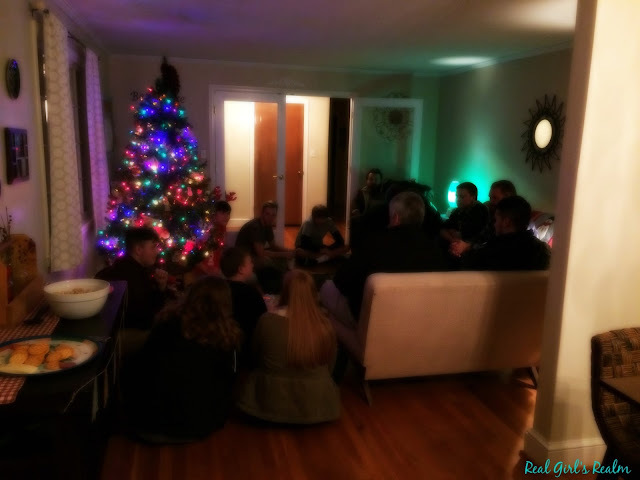 This is a fun way for the youth to interact with different families within the church. 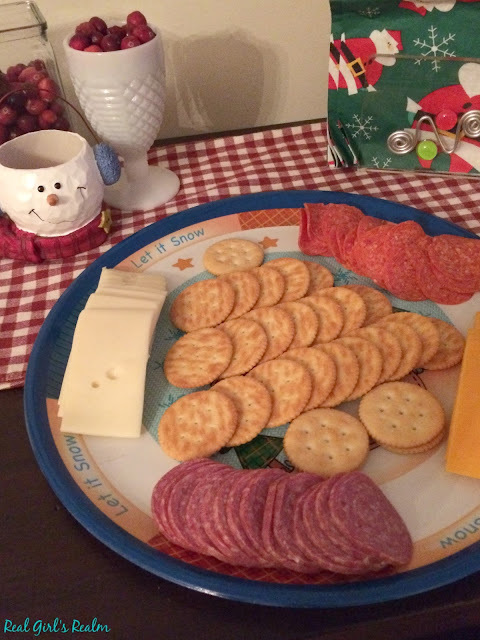 My family hosted the appetizer portion last year and agreed to host again this year. If you follow me on Instagram, you may have caught some of the fun in my InstaStory! Once the date and time has been set, it is time to start planning. I head to my Yummy Appetizers Pinterest Board to help me plan my menu. We have a group of around 15 kids that range in age from 13-18 years old and they are mostly boys, so I need a lot of food! Pick 4-6 appetizers and have a mix of sweet and savory and several drink options, including a hot one. I also try to pick a mix of recipes that I can prepare before hand vs ones that need to be served hot, so I am not making all of the dishes at the last minute. 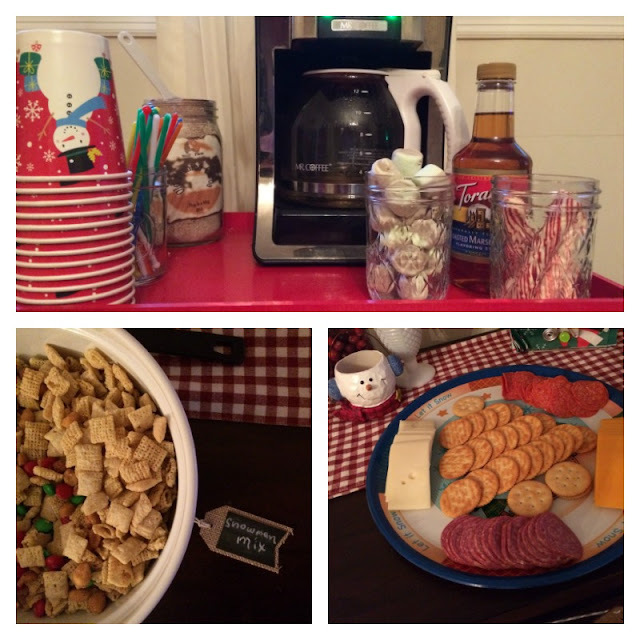 For drinks, I served assorted sodas, tea, and hot cocoa. Write out the menu on a chalkboard or label the dishes, so your guests know what they are eating. 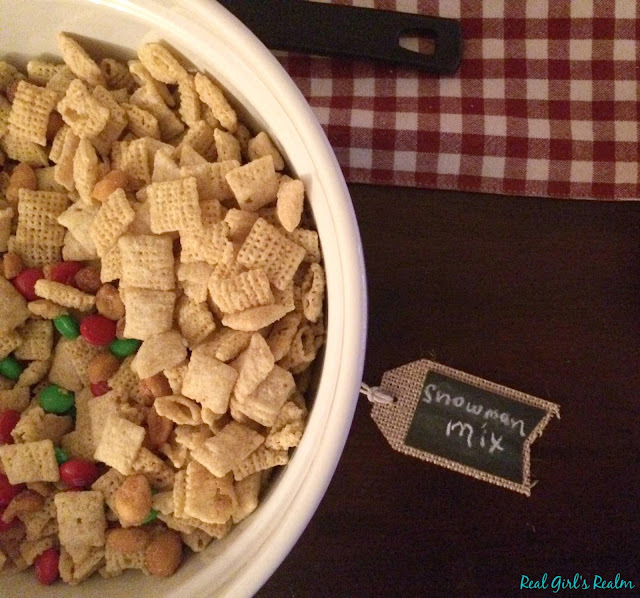 I found these cute, chalkboard tags in the Target dollar spot a while back and used them for the Soup Party I hosted earlier this year. 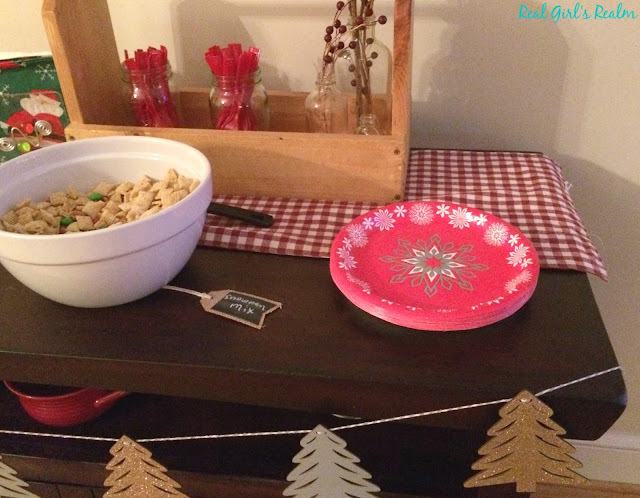 Use disposable plates, utensils, and cups, so cleanup is a breeze. I picked up the festive plates and cups at the dollar store and displayed the utensils in mason jars. Have several "stations" so everyone is not congregated in one small area. I set up the food and drinks on both the serving buffet and dining room table and used a beverage stand for the hot cocoa bar. 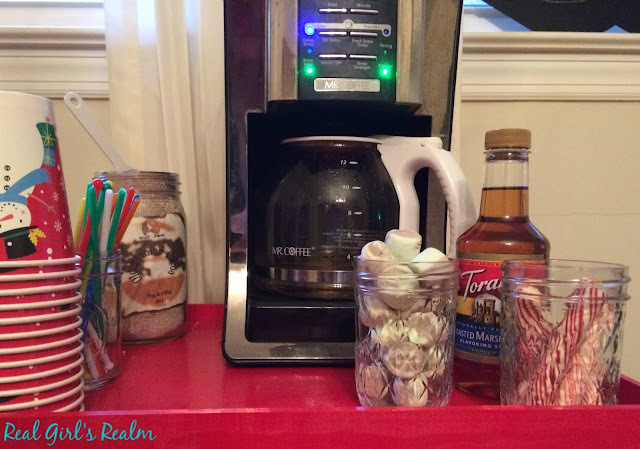 I used mason jars to hold the marshmallows and peppermint sticks. 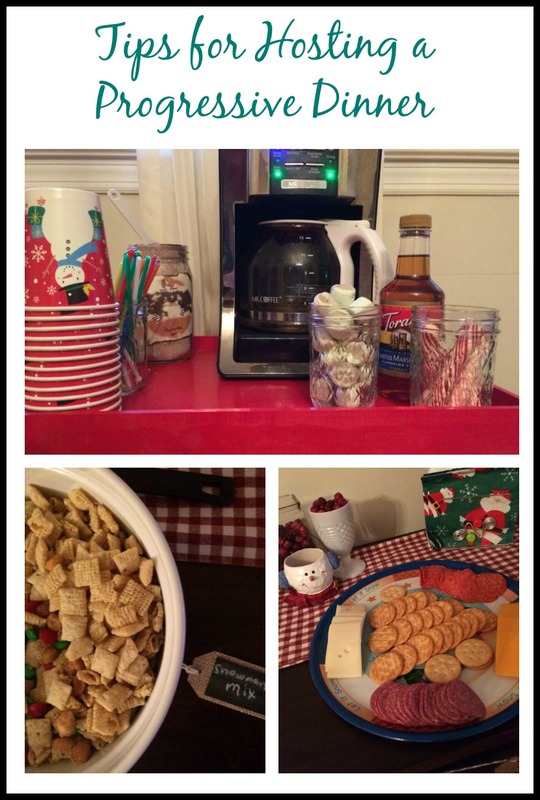 Plan 2-3 games/activities to fill the time, while the teens are snacking. Our Youth Minister brought a few games, like CatchPhrase, which they played the majority of the time. Have you ever hosted or participated in a Progressive Dinner? If so, comment below with your favorite memory! Years ago I organized a progressive dinner in our neighborhood and it was always so fun! 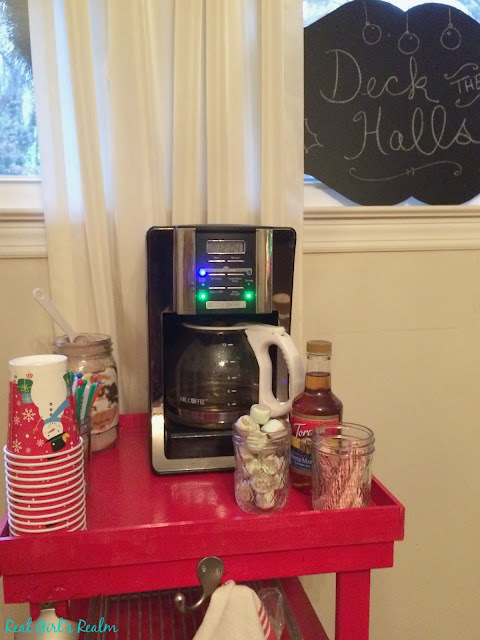 Your hot coca bar is so cute and I love your chalkboard tags! Thank you! I enjoy it as much as the kids! They are a load of fun! They are! Thanks for visiting!